The 23rd monthly edition (hosted by Cucina Testa Rossa) of the premier food blogging event Is My Blog Burning? requires us to create something staunchly French. I was planning on taking on the formidable task of cooking bouillabaisse or cassoulet but the sheer scale of the mammoth undertaking made me chicken out. Just the number of ingredients plus the length of time it will take to cook it completely intimidated me. I could easily have opted for the more easy or shorter versions of it but for me that would be cheating. So in came this idea of doing my son's request of a Quiche Lorraine. A quiche is also known as a flan or tart. This version, as you might have guessed, originated in a north-eastern region of France called Lorraine. A once independent and properous region, it was only assimilated to what we know now as France as late as 300 hundred years ago. Due to its position by the German border, it saw its owners changing hands several times during World War I and II. More of its history can be seen here. The first time I made this is via a BBC Good Food magazines 'ultimate' recipe. In there, it instructed to add Gruyere cheese. I did, but my son would not even touch it. He objected to the smell of the cheese. 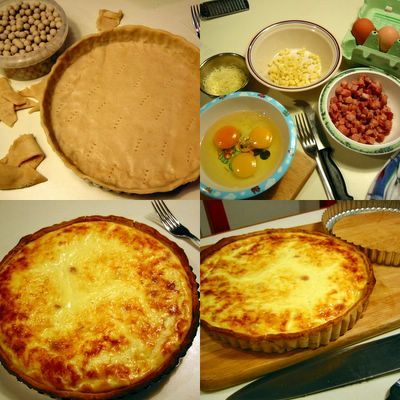 So I researched on what constitute a traditional quiche Lorraine. 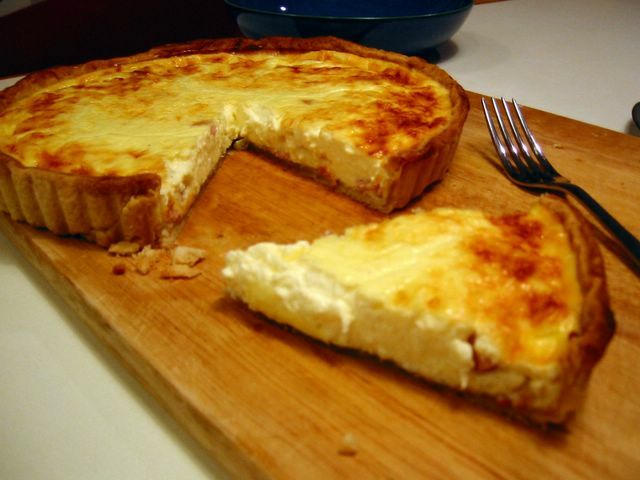 According to Elizabeth David in her book, French Provincial Cooking, the Quiche Lorraine that the natives of that region regard as such is simply a savoury custard pie with eggs, cream, smoked bacon and *no* cheese. That was a revelation to me, since everywhere I went whether here in UK or in Paris, these tarts almost always have some cheese in them. But I have to agree with Ms. David because when we passed by the area of Nancy in Lorraine last year, all the Quiche Lorraines we ate had no smidgen of cheese. That settled it, I have to do this first without the cheese then with it (just to make the comparison). I have to admit I liked it regardless if it has cheese or not. Surprisingly, my son favoured the one with cheese. Could it be because I used the less smelly mature cheddar? The dominant flavour of the smoked bacon in the custard was simply divine whether served hot or cold. Although I have to remember next time to make the crust thicker. I like it thick as a foil to the richness of the filling. This is best served with a big salad and a chilled Sauvignon Blanc. (sorry no pictures of the wine) Recipe was adapted from the September 2005 issue of the BBC Good Food Magazine. Take 2/3 of the cheese and cut it into small dice. Grate the remaining 1/3 of the cheese. Put all the ingredients in a food processor and process until it forms into a ball. Or if you don't have a food processor: cut the butter into the flour in a bowl until it has the consistency of coarse crumbs. Add in the egg yolks and toss with fork. Sprinkle the water little by little until you can gather the mixture into a ball. 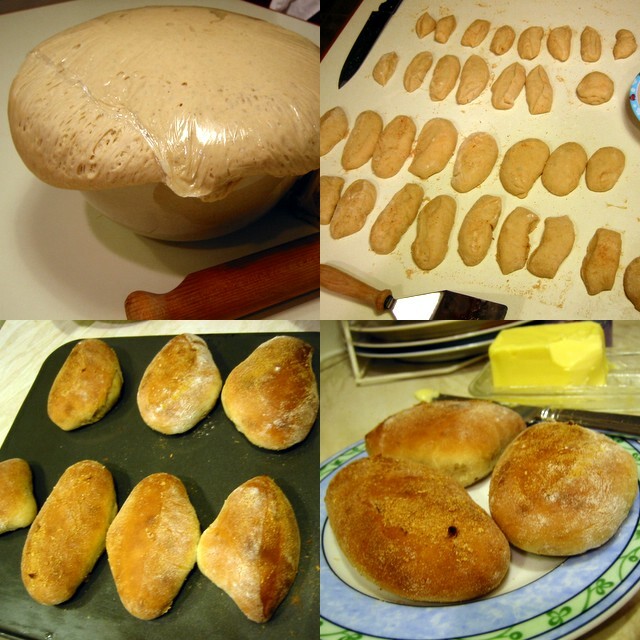 Press and knead between your hands until it just about holds together. Roll out with a rolling pin into a circle 11 inches (28 cm) wide. Carefully put on a fluted tart pan. Trim the pastry edges about 1/4 inch higher than the pan edge. Press the pastry into the flutes and prick the base with a fork. Chill for 10 minutes in the fridge. Bake blind: put a piece of aluminum foil (shiny side down) on the pastry-lined pan. 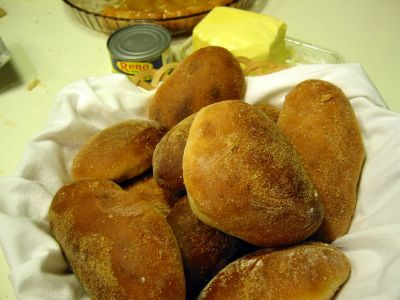 Fill it up with dry or ceramic beans and place on a baking sheet before putting in the oven. Bake for 15 minutes. Remove foil and beans. Bake for another 4-5 minutes. Reduce oven temperature to 190°C/fan 170°C/375°F. Fry the bacon (without oil) in a small frying pan. Remove any liquid that comes out and cook until bacon changes color. Drain on paper towels. Mix the double cream, eggs, and nutmeg in a container. Scatter the fried bacon and diced cheese on the bottom of the pastry case. Pull out half of the oven shelf and place the pastry case/tart pan on the baking sheet. Pour the double cream mixture in the pastry case. Scatter the grated cheese on top. Carefully push the oven shelf back in. Bake for 25-30 minutes or until golden brown. Remove from oven and cool for about 5 minutes. Serve hot or cold. First time I heard the name, I thought it was stewed rabbit or maybe lamb. My son (J1) thought it was frogs. :) We had no idea that it will be something very tasty and delicious and very easy to make. That's one thing I like about Brits they affix witty, oftentimes funny, names to their food. 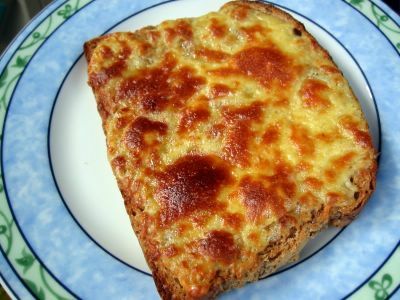 This my friends, is essentially grilled cheese on toast, as simple as that. But made several degrees more delicious with the small addition of flavourings. Sharp tasting cheddar would be best so the extra mature ones would be great and in the US, the Kraft Crackle Barrel brand comes to mind. The Canadian extra mature cheddar would be excellent as well. So far, this is the best version I've tried which is adapted from Brian Turner's Favourite British Recipes. J1 was very wary when he saw me making it. Just when I was adding in the English mustard he declared he's not going anywhere near it. Fine I thought. Come early morning he saw me grilling these babies. He asked if the ones in the oven are plain cheese and not the welsh rarebits. I said yes (I lied). So down he scoffed one. All I heard were - hmmm ... mmm ... and something along the lines of "it's delicious". That's when I broke the news that it was actually Welsh Rarebit. He was grinning from ear to ear. See, mums have to do a lot of underhanded tactics to make their kids eat something different and I'm glad my lie did not go to waste. LOL! Heat the double cream until gently boiling. Add the beer and bring back to boil. Turn off heat; add the Worcestershire sauce, mustard, and grated cheese. Blend well. Add the egg yolks and stir well until the cheese has slightly melted and mixture is soft and liquidy. You may have to return the saucepan to the cooker at very low heat. Put in a container and cool. 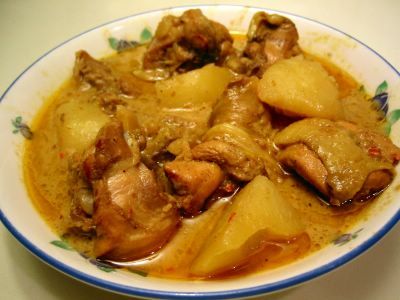 (It is best to use this the next day to let the flavours develop). Arrange the bread slices under the grill to toast one side. Remove. Spread a generous amount of the cheese mixture on the *untoasted* side of the bread. Put back under the grill until golden and bubbling. Serve warm. Sorry the picture isn't so pretty. Me and my husband were already quite famished when I took out of the oven. There was no time to arrange and make it pretty coz we were ready to devour it! 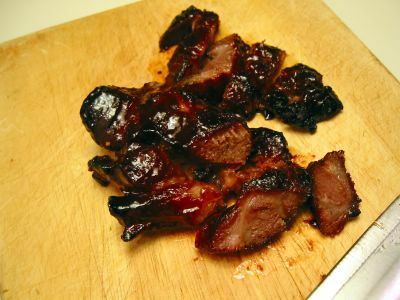 I have several recipes of Char Siu or Cha Siu - known in English as Barbecued Pork. I intend to try them all but first I did Renee's (of the now defunct Shiokadelicious blog) recipe. Shame her formerly very popular and award-winning food blog is not online anymore. She probably is busy with some other things. 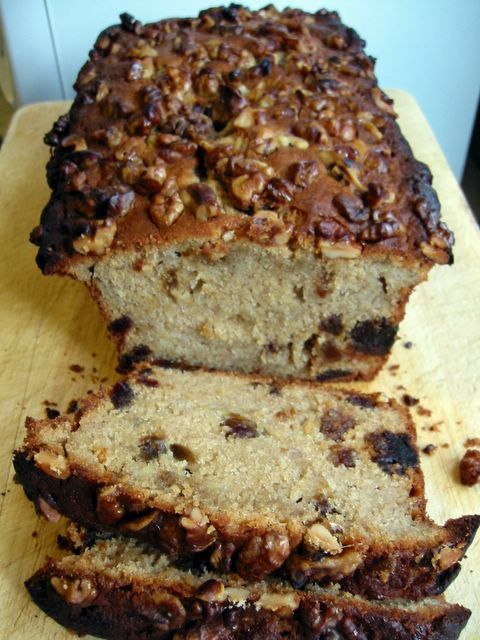 Thanks very much Renee for sharing the recipe! This is the reddish lightly charred roasted pieces of boneless pork meat hanging off a hook that you see in lots of Chinese restaurants. Very nice teamed with hot steamed rice poured with some soy sauce based sauce. Used in so many other Chinese dishes such as noodle soups, stir fried noodles, char siu pao (siopao), etc. It's quite universal and basic in Chinese cuisine or at least in the Cantonese style of cooking. Mix all ingredients (except pork) in a saucepan. Heat for about 1 minute just enough to dissolve the sugar. Remove from heat and cool. Marinate pork in this mixture for at least overnight. Preheat oven to 210°C/fan 190°C/410°F. Remove pork from the marinade and arrange on a rack set on a roasting pan with about 1/2 inch of hot water in the pan. (This is to keep the meat moist during roasting). Bake for 15 minutes. Lower heat to 180°C/fan 160°C/350°F, baste the meat with its marinade and turn them over. Cook for a further 15 minutes. Baste again with marinade and cook for another 10 minutes. Check if meat is done. Remove from oven, brush with the warmed maltose (glaze) and grill for about 2-4 minutes until it's nicely browned or charred - whichever degree of finish you like. Serve hot or cold sliced on hot steamed rice, noodles, etc. I found another beancurd recipe to use up a box that was soon to expire. This one has a very tasty and slightly spicy batter. And I suspect this is very similar to the fried beancurd we used to have in a Chinese restaurant in the basement of the old Makati Cinema Square in Pasong Tamo Ave. down in Makati. That one had a very nice sauce which complements it well. I guess I'll have to concoct that next to complete the similarity. The book The Food of China yielded this nice dish. Combine flour, egg, salt, sugar, chicken powder, chilli sauce, pork and enough water to make a batter with the consistency of double (heavy) cream. Cut the beancurd into pieces of 1/2 inch thick, about 2 inches long, and 1 inch wide. Heat oil in a wok or saucepan until slightly smoking. 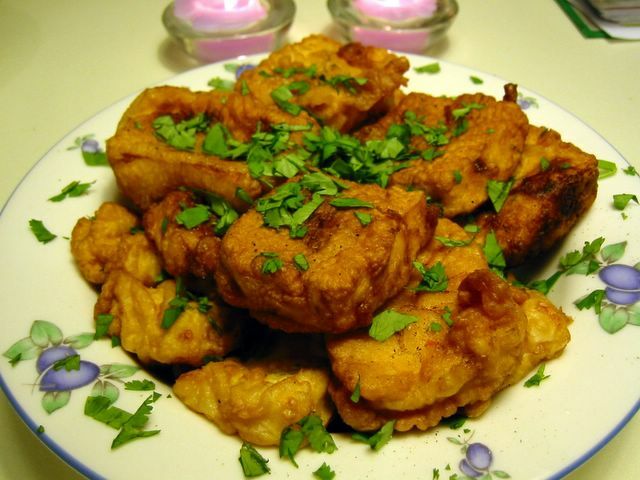 Dip the beancurds in the batter then slip them one by one and in batches in the oil. Deep fry for about 3-4 minutes or until golden brown. Garnish with black pepper and herbs. Drink lots of water. Even when not on a diet, we don't often take the recommended amount of water everyday. We need it much more when we're demanding a change in our body during diets. The recommended daily amount is between 6-8 glasses. Believe me when we drink it that much and that often you'll feel so much refreshed and our skin will look nicer afterall it washes away toxins from our body and gives us a very necessary ingredient to our bodily functions. Drink up! Exercise regularly. I should tell this to myself. *sigh* It's becoming a habit now of me forgetting to exercise to help in the shedding of the pounds. As you well know, just dieting will not make your weight loss stick. With a regular regime of exercise, not only will your weight loss accelerate but it will most likely help keep it off. Besides exercise makes your body secrete endorphines which makes us happy bunnies. Right frame of mind. For me this is one of the most crucial thing before I set off to do something. I have to visualise it and create it in my mind first before physically acting on it. Otherwise the venture would be just half-hearted and many times won't work. So it's important for me to start a diet with a firm resolve and will power to carry it through. Well I hope I can follow my own advise. ;) I actually don't know who to tag next so if you're interested please tag yourself. Now, I think I was tagged for another meme ... what was that one? Hmmm ... thimk think thimk. If you recall a month ago, I made leche flan several times. After that, I was like a woman possessed and obsessed with trying to use up all the resulting left-over egg whites. Thus all this flurry of recipes of meringue-based desserts that makes use of the egg whites so effectively. I think I should make another recipe category here - 'Egg Whites Repository' or something like that. This cake was described by a friend as having a very delicate lovely flavour. What I like most about it is the contrast of the softness of the cake with the crunch of the almonds and chocolate chunks then topped with the sublime cloud of apricot-flavoured whipped cream. This is definitely a keeper. Adapted from my favourite 101 Cakes and Bakes of the BBC GoodFood Magazine. Preheat oven to 180°C/fan 160°C/350°F/gas mark 4. Butter and line the base of a 25 cm (10-inch) springform pan. Beat the egg whites until stiff. Then gradually whisk in the caster sugar, a tablespoon at a time. Using a metal spoon, lightly fold in the ground almonds, toasted flaked almonds, and the chopped chocolates. Pour the mixture into the pan and bake for 40-45 minutes until crisp at the top and light golden. Remove from oven and allow to cool in the pan for about 5 minutes. Turn out and leave to cool on a wire rack. Beat the cream until soft peaks. Fold in the apricot compote gently to give you swirls of apricot. Spread this mixture over the torte. 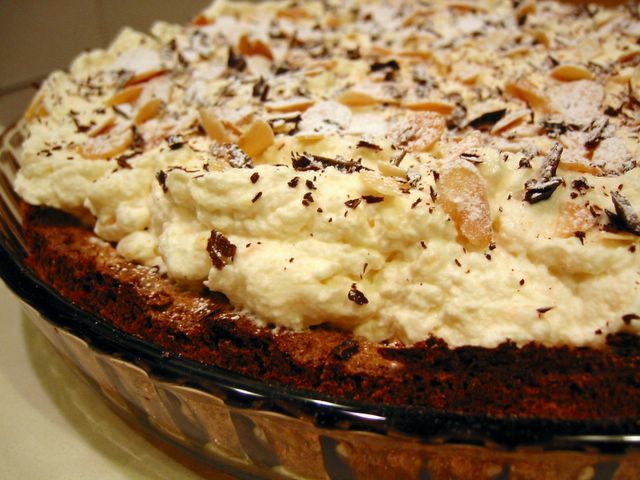 Scatter the shaved chocolate and toasted flaked almonds on top of the apricot cream.